vSTAC Watch nodes deliver globally hyper-converged (GHCI) compute and storage resources that scale as nodes are “stacked” in a Pivot3 virtual storage and compute array. Each vSTAC Watch node includes a high-performance VMware ESXi virtual server environment which allocates cross-cluster compute resources to surveillance applications. Pivot3 vSTAC OS pools storage resources across the entire hyper-converged system and presents them to the application as a virtual HyperSAN. Each Pivot3 hyperconverged systemcontains up to twelve vSTAC Watch nodes and can be expanded on the fly withoutsystem downtime. 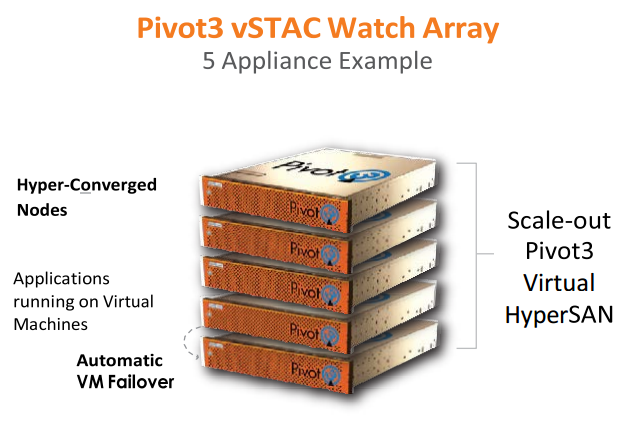 vSTAC Watch nodes integrate a virtual server and scale-out storage resources in a common appliance that saves up to 40% in power, cost and rack space over physical servers and physical SAN storage. Storage and servers have traditionally been managed and protected as separate entities. The vSTAC is self-healing for storage failures and supports self-healing single-vm restarts using the Pivot3 VM Failover™ feature. Support for optional real-time failover solutions from VMS Partners and from VMware is also provided. Storage can be logically and physically expanded while nodes are running to meet the needs of the most demanding environments. Nodes contribute new capacity, bandwidth and RAID resources to the expanded vSTAC. Pivot3 uses virtualization technology to rejoin servers and storage in a single node that can be managed by server and network administrators. There is no need to master complex SAN concepts since the vSTAC is based on familiar Ethernet and server standards. Purpose-built surveillance hyper-converged appliance capacity chart for 12 appliances with 12 drives each.